Chaz Davies (Aruba.it Racing - Ducati) set a 1’45.662 lap on his second go around on Pirelli’s latest new rear qualifying tyre to take his second pole of 2017 and the fifth of his career. The existing track best of 1’45.598 just survived the onslaught of the top riders. Having dominated the earlier practice sessions at Ducati’s real home track Davies headed up Tom Sykes (Kawasaki Racing Team) by 0.032 seconds in Superpole 2, with Jonathan Rea (Kawasaki Racing Team) 0.324 seconds back from Davies. 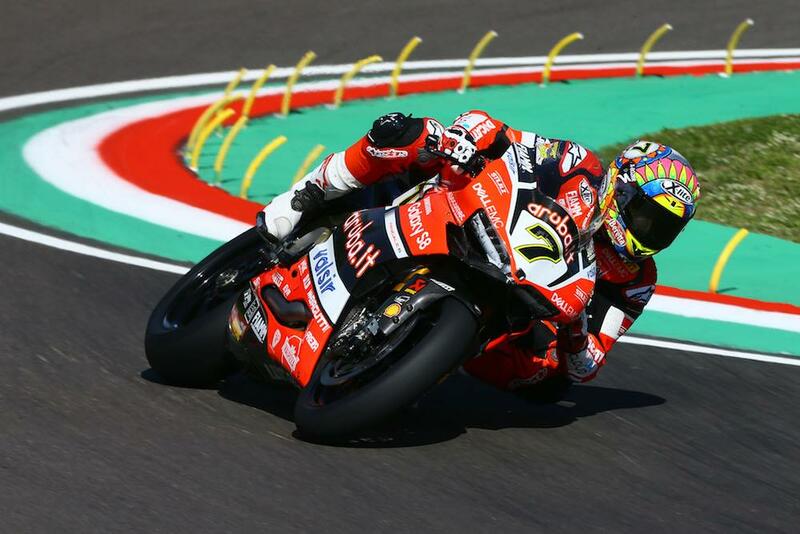 A strong push from Leon Camier (MV Agusta Reparto Corse) saw him front up the second row, in fourth position, with local hero and multiple podium rider already in his comeback season, Marco Melandri (Aruba.it Racing - Ducati) fifth. The top six was rounded out by the improving Eugene Laverty (Milwaukee Aprilia) - despite suffering some issues and an eventual fall on day one. Privateer Xavi Fores (Barni Racing Ducati) placed seventh on the race one grid, with Leandro Mercado (IodaRacing Team Aprilia) and Michael van der Mark (Pata Yamaha Official WorldSBK Team) ranged out behind him on the third row. Lorenzo Savadori (Milwaukee Aprilia) pipped Alex Lowes (Pata Yamaha Official WorldSBK Team) for the last place inside the top ten, as Stefan Bradl (Red Bull Honda World Superbike Team) completed the top 12 despite a fall in FP3 this morning. Nicky Hayden (Red Bull Honda World Superbike Team) did not quite make it into Superpole 2 from Superpole 1, and started 13th on the grid. Like his team-mate he had also suffered a fall in FP3. Race one gets underway at 1pm this afternoon.